RIGS Mechanized Combat League is a sports/shooter game that puts players in command of one of a number of mechanized athletes in order to play some truly unique sports. 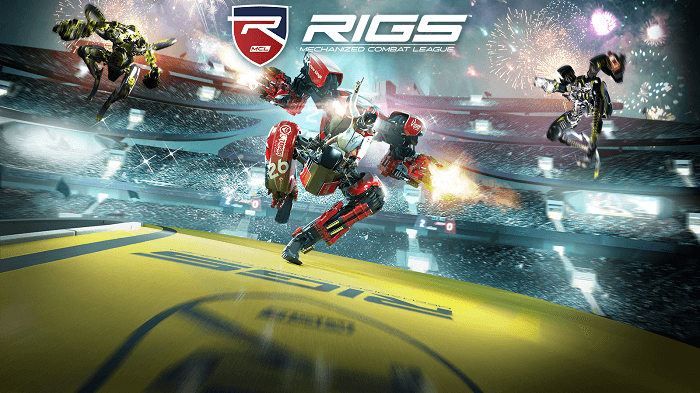 With some unique game-play ideas and a few new ideas, RIGS is an interesting entry into the growing world of virtual reality. What if the world of sports involved highly customized mechanical monstrosities instead of finely tuned athletes? That’s the question asked and answered by RIGS, a game that is one part future sports game and one part competitive shooter. In our RIGS VR Review, we spent as much time in combat with other mechs as we did trying to score goals, highlighting just how much of a genre hybrid this game really is. Like most sports games, RIGS’ story is pretty flimsy. In reality, it doesn’t matter – this is a purely competitive game that tasks players with pushing themselves (and their mechs) to the limits against both human and AI players. It takes notes from dozens of other games that have tried to combine combat and sports, but does so in a way that really highlights the capabilities of virtual reality. While the controls for the game are standard, the fact that all of the aiming and looking around is done with a headset does make the game feel quite immersive. Above all else, RIGS is a competitive game. It feels like many of the other VR games that have been designed with competitive play in mind. Nonetheless, it does seem a little less e-Sports friendly in mind. Players get their choice of various RIGS (aka mechs) that suit their play-styles, and use their advantages to try to overcome their opponents. It’s nothing that we haven’t seen before in various other games. However, combining it with some tried-and-true sports formulas makes the game feel far fresher than it should. There’s no doubt that Rigs is a really cool idea for a game. It’s definitely taking a little bit from the Rocket League school of competitive game design – find something that’s mundane and add a crazy twist. It feels a lot like Smash TV or Monday Night Combat in terms of presentation, even if it’s mostly giving players a twist on some more standard game types. Just the idea of playing robot-assisted basketball or football is really enough to put a smile on most faces. The concept of the individual Rigs is also awesome. There’s just enough variety in the mech types to allow you to find a way to customize your own game experience. While they’re not so different that you’ll be useless if you pick the wrong Rig, you’ll have a lot more fun once you unlock the mech that suits your own personal play style. Unlocking the Rigs and then mastering their various differences is a fantastic experience. While it’s not something that necessarily translates to most other sports games, it’s a concept that definitely bears further exploration. When we could play, we had fun putting together our RIGS VR review. While we did have a good time with this Rigs VR review, it’s important to note that this game is far from perfect. In fact, it’s got some glaring flaws that more than overshadow the things we actually liked about the game. These are the kind of game-breaking issues that take Rigs from being a fantastic bit of VR technology to the kind of game that becomes very hard to recommend. The first, and biggest, problem is with matchmaking. Because Rigs is a competitive game, you want matchmaking to be as close to flawless as possible. Unfortunately, the game falters hard on this account. When you look for a random match, you’re going to find yourself waiting far longer than necessary. Whether is due to a small install base or software issues is unknown, but it kills the ability of a player to just pick up the game and start playing. That’d be less of an issue if the game didn’t look so dull. Rigs doesn’t have that kind of immersive VR feel that you want from the look. This means you’ll spend far more time being taken out of the game by bad graphics than you’ll spend getting sucked into the fiction of the game. Not only will you have a hard time finding anyone to play the game with, then, but the product you’ll get when you do play simply doesn’t look great. This is one of the very rare PSVR games that won’t let you use many of the system’s peripherals; don’t bother unpacking your Move controllers for the game. Likewise, you won’t get a chance to break out the fancy new PS Aim shell for this one. If you get a chance, it’s best you play it with the Playstation 4 Pro model. While the game runs just fine on the base unit, the Pro’s slightly elevated performance will give you a better time when you play this game. While Rigs is definitely not the most taxing VR game on the market – or even on Playstation’s VR system – having a little extra power behind the rendering is always a plus. We had a lot of fun with our Rigs VR review. However, that doesn’t necessarily mean that we can recommend the game for all players. While it’s got a lot of good ideas, the execution still isn’t quite there. RIGS: Mechanized Combat League is a good look into what VR could do on the competitive scene. Nonetheless, it’s lacking in so many areas that it’s more a case of what could have been than anything else. This is a solid game to try out on someone else’s PSVR, but it’s hard to recommend buying the product for yourself. Xtreme VR Vue FX Review: Affordable, But Is It Any Good?